If you're interested in rubber stamping and card making, personalized rubber stamps can be a great addition to your crafting toolbox. Personalized rubber stamps are available in a variety of font choices, ranging from whimsical to sophisticated. Stamps can be ordered with or without accompanying artwork. However, you cannot order a custom rubber stamp that violates copyright laws. 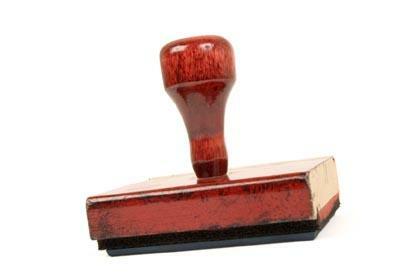 When you order a personalized rubber stamp, you'll need to decide whether you prefer a handle mount, wood mount, self-inking mount, or pre-inked stamp. This will depend on your personal stamping preferences, what types of projects you plan to create, and whether or not you wish to use more than one ink color with your stamp. You'll also need to choose between a stamp made from red rubber or one made from a clear photopolymer material. Stamps made from red rubber are typically more expensive, but many crafters feel they work better for projects that involve heat embossing or stamping with permanent ink. Paper Angel sells a number of personalized rubber stamps in round and rectangular designs. Non-personalized art stamps are also available. The Stampin' Place sells handle mount, wood mount, self-inking, or pre-inked customized stamps. The company also offers the option of using your own black and white line artwork to create a one-of-a-kind stamp with no text. Stampics specializes in creating rubber stamps that combine a digital photo with your choice of text. These stamps can be used on a variety of paper crafting projects. At 1 Stop Square, you can order personalized rubber stamps as well as a number of basic rubber stamping supplies. Namib Rubber Stamps sells handle mount stamps personalized with your choice of message. The Stamp Maker lets you use an interactive online ordering system to create your own customized rubber stamp. If you're interested in creating a variety of customized rubber stamps, you may want to pick up a copy of The Weekend Crafter: Rubber Stamp Carving: Techniques, Designs & Projects by Luann Udell. This helpful resource offers step-by-step instructions and illustrated tutorials for a number of stamp carving projects.